So, I'm a bit obsessed with games. Love to play games of all varieties, whether it be tabletop or video games. So, it will probably come as no surprise, that I try to play games when I can find the time and money to afford such things. 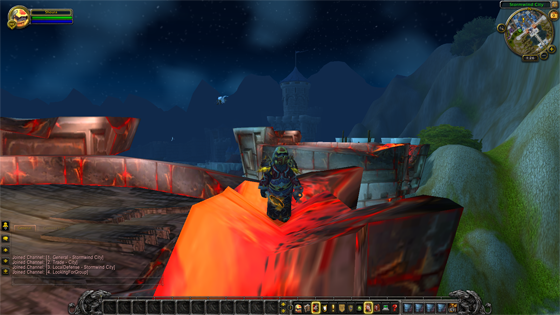 Several years back I started to play a little known game called "World of Warcraft". A game that turned into a sort of obsession for millions of individuals, an addiction that could be likened unto some form of digital cocaine. But, whatever.... I can quit whenever I want. Now, as the end of September approaches, and another expansion looms on the horizon, I decided, I might as well weigh in on this particular global phenomenon, and so I shall... after the jump. Despite the anger, and frustration, I find myself drawn back to the world time and time again. There is something about the game that calls to me, and brings me back into the fold. But, unlike the average player, I'm not obsessed with the stats, or the competitiveness. I tend to use it more for relaxation. A way to kind of mindlessly kill time. So, I'm not really the core player base, and my style of play tends to severely piss off the more rabid players. When I play, I play about as casually as possible. I tend to enjoy the less competitive beginning areas over the more highly competitive later parts of the game. So, at this point I have played through the initial area of the next expansion several times. Why did I ramble on to tell you all this? So that you know from the very beginning (or at this rate after reading a little bit) that my thoughts on the new expansion are not going to include my thoughts on all the high level instances. On the most part, what you will see here, is my thoughts on the new beginning area. Right here, I want to say I dig the opening area for the Pandaran. It is a well thought out are, that is frankly one of the more beautiful areas that Blizzard has created. The music they added gives it a nice Eastern flare, an issue I find with the opening area, is that all classes are not created equal. Playing through as the new Monk class, was almost too easy, while trying to play through the same area as a Mage was next to impossible. By level 6 my Monk had not yet died, at that same milestone, my Mage has managed to die 4 times. Another feature that I was told to look at was the new Beast Battle system, or as I have come to refer to it, "World of Pokemon". Granted... I know next to nothing about Pokemon, but from the bits I have managed to glean from brief conversations with others, the Beast Battle system is similar in many ways to a dumbed-down Pokemon. This battle system has some promise, and in coming expansions and content updates, I could see this becoming something very interesting. The biggest downfall is that the cost of the training makes it prohibitive for a new player to come in to play with this system, thus necessitating players to backtrack to earlier zones in order to level their pets. Mildly frustrating to be sure. And I just spent the last two hours or so (lost track of the time) playing through some of the post-Cataclysm content. One of the greatest features of the public test realm is being able to create new characters at level 85, giving you the ability to go in, and start on the new late level content right away. Keep in mind that this is for testing purposes, and will not be available (to my knowledge) in the final build. The new content is very story driven, starting you out looking for the missing son of the king of Stormwind (for the Alliance... I rarely ever play as Horde, so I have not checked out that content). The new content is fun, but can be a little daunting, in that it takes over 13 million experience points to get from level 85 to level 86. Sure the average quest I have been picking up gives you over 100k experience, but it will still take somewhere in the neighborhood of 100 quests to get a single level. All in all, the new expansion is looking to be a lot more light-hearted than Cataclysm, adding a much needed injection of levity into a game that had been getting increasingly dark. Sure, I am a big fan of the darkness, but when it is all that you are being given, it can become tedious. In two weeks, the game will hit the shelves, and when it does, prepare to lose months of your life exploring the new land of Pandaria. And seriously, try out the Monk, it's a versatile class, and definitely a unique addition to the class system. For now, I'm heading back into the test realm to see what else I can see.